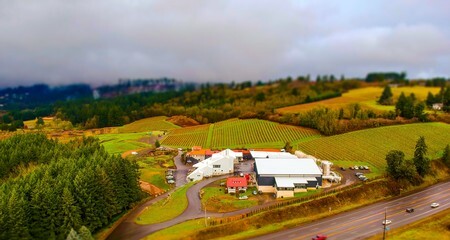 A to Z Wineworks, a family owned winery, consistently offers well-made wines expressing the Essence of Oregon®. Since debuting its inaugural 2001 Pinot Noir, A to Z has worked with more than 100 vineyards throughout Oregon, encouraging sustainable practices and offering assistance to that end. Diverse sourcing across the state offers complexity and depth to the one wine of each variety that is blended each vintage. In May 2014, A to Z Wineworks became a certified B Corporation and has been honored as a Best in the World B Corp each subsequent year. The certification demonstrates A to Z Wineworks’ commitment to transparency, accountability and social, environmental and economic improvement. If you have any more questions that are not answered below, please contact Katie Quinn at Katie@AtoZwineworks.com. 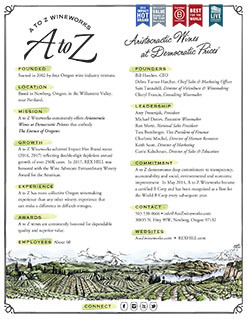 A to Z Wineworks was started in 2002 by four friends, Oregon wine industry veterans, Deb Hatcher (Eyrie), Bill Hatcher (Domaine Drouhin Oregon), Sam Tannahill (Archery Summit) and Cheryl Francis (Chehalem). The two couples worked in the Hatcher’s kitchen to build the original blend honored by Food & Wine Magazine as the Best American Pinot Noir under $20. 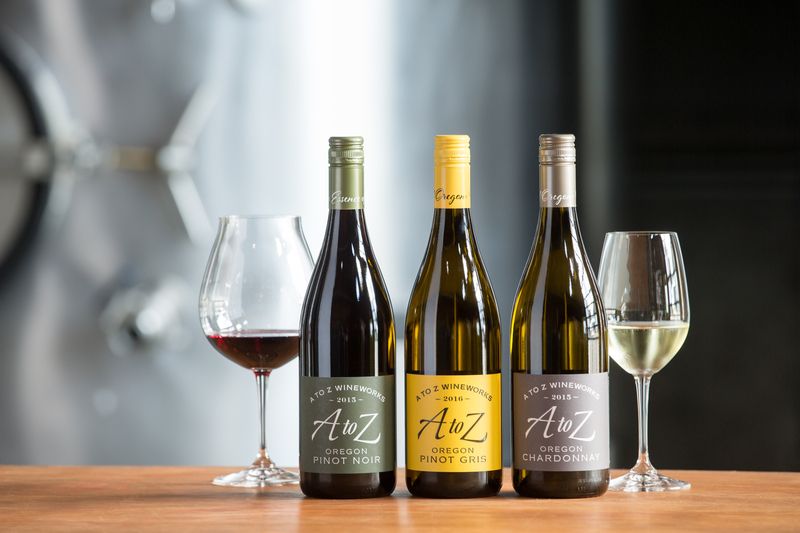 Recognition for their A to Z wines with dependable quality and great value continued and production grew. In 2006, the group welcomed another Oregon wine veteran, Michael Davies, as winemaker, and partnered with Gregg Popovich (Coach of the NBA San Antonio Spurs) to buy REX HILL Vineyards & Winery (established in 1982). A to Z has more collective Oregon winemaking experience than any other winery, experience that can make a difference in difficult vintages. A to Z has worked with more than 100 vineyards across the state always encouraging sustainability certification and offering assistance by staff viticulturists. For all owned and many long-leased vineyards, the group farms using biodynamic principles. Diverse sourcing across the state offers complexity and depth to the one wine of each variety that is blended in any vintage. A to Z remains true to the dual mission of offering the highest quality wines for the best value while building a company that combines conscience with commerce. A commitment to excellence is matched by a belief in fair value and sustainability in business as well as in farming. A to Z Oregon Pinot Noir has twice been named to Wine Spectator’s Top 100 wines of the year; A to Z Oregon Pinot Gris is a perennial Best Buy; and A to Z Oregon Chardonnay is America’s Best Selling Oregon Chardonnay. Can't find what you're looking for? Contact Emily Ojdana at EmilyS@AtoZwineworks.com. Check out more videos in our video library. Click on each photo for the hi-resolution file.